They say that an ounce of prevention is worth a pound of cure, and when it comes to you and your children’s health, every ounce is well worth the effort! Creating a nutritional meal plan when you are planning on adopting a baby can prove to be a very smart move for everyone in the family. In our last blog, we focused on the importance of nutrition for you and your growing family, along with the long-term benefits of doing so. Today, we’ll look more into daily tips that can prove beneficial throughout the entire childrearing process. Anyone seeking open adoption options will benefit greatly when they work with A is 4 Adoption. Our experienced adoption center works to minimize the inefficiencies presented by your standard adoption agency in California. Our representatives are here to help you every step of the way throughout the adoption process, minimizing the stress while streamlining success. From your first meeting with the birth mother to your adopted child’s graduation day, proper nutrition can prove very helpful at every stage. When you and your family take on a healthier diet, everyone wins! Eat slowly. One issue many Americans face is overeating, and speedy mastication can be to blame. It takes roughly 20 minutes for your body to send signals to the brain indicating that your stomach is full. Eating quickly can result in excess eating, upping caloric intakes unessecarily and making people feel bad. Consume more fruits and vegetables. These food groups are ladened with antioxidants, fiber, minerals, vitamins, and more. The benefits of doing so are well-documented and lengthy, as these positives provide superior protection against diseases. Consuming more fruits and veggies also replaces the high-calorie count associated with junk foods. Eat more whole grains. This food group serves the same purpose as fruits and vegetables, providing a plethora of healthy vitamins and minerals. Additionally, studies have shown that whole grains help to reduce your risk of obesity, heart disease, and more. Focus on breakfast. One habit that your family can benefit from is planning and eating a healthy breakfast every morning. Doing so supplies you with the energy needed to take on the world. When people skip breakfast and face hunger soonafter, the ability to say no to unhealthy foods quickly wanes. Keep hydrated. Drinking water is a healthy move for many reasons. In weight control terms, H2O is vital for boosting your metabolism while also acting as an appetite suppressant. We recommend drinking low-calorie beverages to keep your caloric intake under control. Mix up the choices. One issue many people face when eating healthy is consuming the same nutritional meal day-in and day-out. Frustration quickly ensues, followed by a breakdown of dieting discipline. We recommend serving a wide variety of food options to keep everyone enthused about eating right. 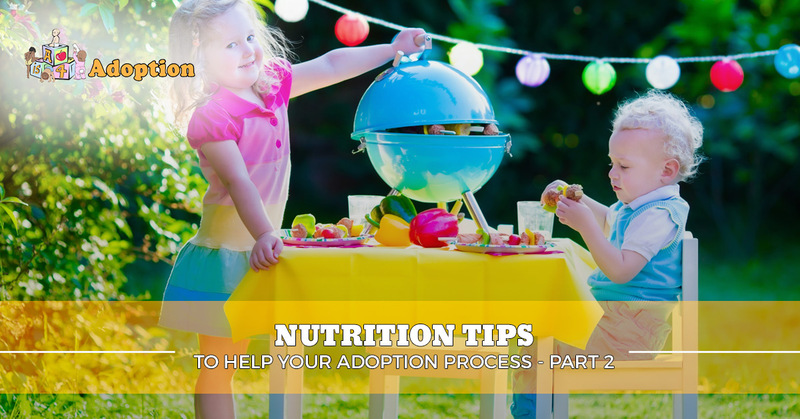 There are plenty of ways in which adoptive parents can begin to change their diet before adopting a child. While our nutritional recommendations may be helpful in starting your journey toward quality food consumption, they are by no means comprehensive. Next time, we’ll look at a few food tips that can help parents avoid common mistakes when feeding their family. When it comes to the adoption process, the child should be made a top priority, for nutritional reasons and much more. A is 4 Adoption is here to help any adults seeking adoption options to grow their family. By offering top-notch birth mother help and a customized adoption plan, our experts are able to achieve more favorable results in a quicker manner. If you’re looking to adopt or are considering putting your child up for adoption, feel free to contact us today for assistance!